James Donovan began as an apprentice to a watch maker in Aurora, IL, working his way up to Lead Mechanic and an eventual partner in the company, before branching into jewelry on his own. Accompanied by his sister in 1894 he came to Los Angeles for a month’s long vacation. At the end he decided to stay one more week – then three more months – and then founded to stay. He began Donovan & Seaman’s Co on Spring St, near Temple, when it was the heart of the LA’s shopping district. He later moved the store to 3rd & Spring St, then 7th & Broadway. When he built his residence, he chose a prominent location, placing it directly in front of the Berkeley Square gates, on the southeast corner of Western Ave and 22nd St. The home was designed by R B Young in a Transitional Victorian/Craftsman style, leaning more toward the Victorian. Young was a prolific architect in Los Angeles, designing many homes and office buildings, including the Vickery-Brunswig Building, San Fernando Building and Clifton’s Brookdale. The house was moved to its present location in 1929 as Western Ave transitioned to a commercial thoroughfare and the street was widened. Charles Albert Rockwell was a partner in the building firm Martin & Rockwell, and through his company built several houses in West Adams Heights, on Western Avenue, including: 1926, 1962 and 2020 S Western Ave. He himself lived at 1962 S Western Ave before moving down the street to 2020 S Western Ave. This Transitional Craftsman/Victorian house he sold to Paul Hoffmann, dealing in loans and real estate. While most of the houses along the commercial corridors have vanished, this house and a few others, have managed to survive mostly intact. A 1905 property permit to the building firm Pool & Jones suggests this is one of the few properties in West Adams Heights built on spec (speculation of a perspective buyer). The home was purchased by Ellis Doughl – who may or may not have lived on the property. In 1911 Newton H Foster, a junior clerk for the Santa Fe, appears to be renting the property, and in 1912 the property is sold to F Barmann for $7,500. The 1915 City Directory shows Alphonso (Gen Contr), Herbert (Mach), Natalie (Tchr) and Walter (Mach) Barmann at the property. They had moved from their house on the other side of the Heights at 2047 La Salle Ave. Alphanso Barmann was given the general contract for construction of the 10 story Higgins Building in 1909. The house is Transitional Craftsman/Victorian with strong Colonial influences. Built in the “Elizabethan Style” common at the time, this large Transitional Craftsman/Victorian incorporates half timbering and pebble-dash stucco into the design. It appears to have been built for Hans B and Ethyleen Nielsen. Like a river cutting through the heart of West Adams Heights, the Olympic Freeway as it was first called claimed approximately one-third of the homes, and some of the most significant. The entire block between 21st and 22nd Streets, on Western, Harvard, Hobart and LaSalle were demolished for the project. The prestigious “Harvard Circle” part of West Adams Heights was completely wiped off the map, with only vague and cryptic references left in newspapers and books. This canyon creates a permanent barrier in a once cohesive neighborhood. Plans for the Olympic Freeway were laid out in the 1947, coincidentally occurring a year after racial covenants were determined to be illegal and African-Americans gained the rights to live in the neighborhood. 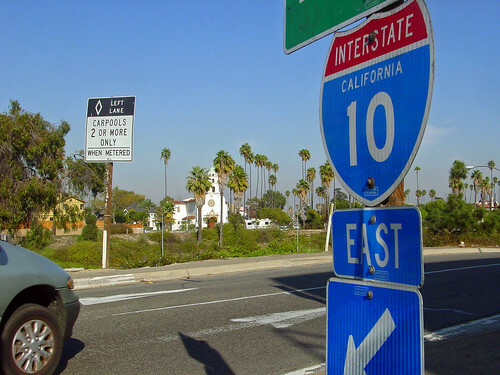 For almost 20 years, until the freeway’s completion in 1964, black leaders called on the city and the State of California to move the path of the freeway to Washington, Venice or Pico, to spare West Adams Heights, or Sugar Hill as it was becoming known. However, the commission overseeing the project ignored them. Even Mayor Bowron participated in efforts to spare Berkeley Square and West Adams Heights, but members of the commission were unmoved. In the early 1960’s the construction equipment arrived, the houses were removed, and one of LA’s most prestigious enclaves was divided. The architecture team of Hunt & Eager designed this home for Kate A Kelley, the widow of John Kelley. She lived there with her sister Jennie MacKay. By 1915 the house was owned by Abram C Denman, Jr., th vice president and general manager of the Southern California Iron and Steele Company. As a boarding house run by the Agape Mission, the house has fallen on hard times, with stucco, an enclosed porch and aluminum windows. But with some time, money and love, the house could be restored. The Kahn-Houston Residence is arguably one of the most important houses in West Adams Heights. It deserves to be a National Register of Historic places. Unfortunately, at this time (2014) its fate is uncertain. The Agape Mission, which has run an illegal boarding house from the property and from 2205 S Hobart, has recently been closed and both properties appear to be in receivership. This house is so important to the historic fabric of the community because it was the home of Norman O Houston, President of the Golden State Mutual – an insurance company for black Americans who could not obtain insurance from white-owned companies at an affordable price. See the Wikipedia article: en.wikipedia.org/wiki/Norman_O._Houston In 1938 Houston (then Vice-President) purchased the home. Wealthy white owners of the neighborhood prevented him from living in his home by re-establishing the “West Adams Heights Improvement Association,” and attempting to codify the rule preventing non-Caucasians from owning or renting property. In 1945 Norman Houston and the other black property owners won the right in court to legally live in the neighborhood. The house had been originally built for John Kahn, an early pioneer to Los Angeles who first came to Oakland, CA, around 1889 with his brother and opened a dry goods store. John moved to Los Angeles 3 years later and opened a large store in the ground floor of the Nadeau Hotel at 1st & Spring. Around 1897 he sold the enterprise and in 1899 incorporated with Jakob Beck to form Kahn-Beck, manufacturing food stuff, including: “All kinds of candy, macaroni and pastas of all kinds.” The company then grew into one of the largest biscuit making companies as the Kahn-Beck Cracker Company, or Kahn Beck Biscuit Company, and Angelus Biscuit Company. John Kahn passed in 1919. The house built in 1911 by the Milwaukee Building Company is in an avant-garde Spanish/Prairie style. For his first home in West Adams Heights, pioneer real estate developer Richard D Richards commissioned Frank M Tyler to build a 16-room English-styled mansion in 1904. Richards sold the property to James D Smith two years later, moving to another Tyler mansion at 2237 S Hobart Blvd and then to 2208 S Western Ave, where the Richards family lived until 1925. James Smith was proprietor of the James Smith & Co, a clothing store of the finest “ready-made” Franklin Brand clothing for men, established in 1902. For years the company operated from the Bryson Block, before relocating to the more fashionable Broadway. In the early 1940’s Louise Beavers joined Norman Houston (2211 S Hobart Ave) and Hattie McDaniel (2203 S Harvard Blvd) in the Heights. Louise Beavers was a talented actress, acclaimed for her role in Imitation of Life as Delilah. en.wikipedia.org/wiki/Louise_Beavers Louise was married to her second husband, LeRoy C Moore in 1952. LeRoy was a well-known interior decorator. Together the two lived at this house until Louise’s death in October, 1962, and LeRoy’s death four months later in February, 1963. At first glass the Smith-Beavers Residence appears to be completely remodeled, but comparing it to original renderings little has changed. The front left dormer is missing and at some point someone thought it would be a good idea to cover the house in Sears siding (the original siding is probably underneath). But other than having been divided, the house’s integrity remains intact. The second residence in West Adams Heights built for Richard D and Cynthia J Richards, in 1906, has been replaced with a 1950’s apartment building. The first Richards home was located at 2219 S Hobart Blvd (the Smith-Beavers Residence). They lived at this house less than two years before relocating to 2208 S Western Ave, where the couple lived out their lives. This home was sold to Ellen H Johnston (Mrs Melville Morton). Melville Morton Johnston may have died April 3, 1892. If I’ve researched the correct person, he was originally from Clifton, Stanton Island, New York. (I mean, how many men named Melville Morton Johnston can there be? Right?) In 1911 Mrs. Johnson sold the house to Curtis Williams. Curtis died at the home in 1959, at the age of 89. Curtis Williams was a pioneering lumberman who came to Los Angeles in 1895. He was born in Oakland and reared in San Diego. He was an early member of the Los Angeles Country Club, the Jonathan Club, and University Club. The house was a rustic Transitional Victorian/Craftsman, having both elements, designed by Frank M. Tyler. It was a perfectly balanced house, whose presence looks more like it would have been designed by John Austin. 28 – Benjamin Johnson Residence – 2241 S Hobart Blvd – 1909 – G A Howard, Jr. In 1909 Benjamin Johnson commissioned G A Howard to build this charming Transitional Craftsman/Victorian in an English Style. The cost in 1909 was a mere $10,000. As president of the Los Angeles Public Market Co (a company owned by Pacific Electric), he could well afford the cost – as well as a domestic, cook and chauffeur. What he could not afford, however, was a scandal involving his under-aged rebel daughter Estelle. In 1914, on a return trip from finishing school in Washington, DC, after a brief visit to her grandfather in Chicago. For eluded reasons, she was hastily married to Mr. Terrance Ryan. To employ his new son-in-law, Mr. Johnson purchased a produce company and gave Mr. Ryan a position and a promise of a bungalow. This appears not to have been enough, and the Johnsons were forced to petition the courts for the divorce of their daughter and Mr. Ryan on grounds he could not provide. The Johnsons must have been scandalized when the entire affair was laid out in the Los Angeles Times society pages. Above the portico of this residence is the address “2249” S Hobart Blvd, however its legal address (according to the tax assessor’s maps) is actually 2263 S Hobart. The confusion is understandable. The property sits on three lots from what would have been 2249 (where the house actually sits) to the actual address of 2263 (which is the furthest lot south from the house). At this time the architect is unknown, but shows the adept hand of someone like Robert D. Farquar, who designed the John and Dora Haynes mansion on Figueroa in a similar style (demolished), or B. Cooper Corbett, responsible for the magnificent Denker Mansion on Adams Blvd. The house is an Italian Villa, in a Florentine style, years before the practice of designing thematic houses became popular in Los Angeles. This was the home of John Newton Russell, Jr., an insurance man. He was raised mostly in Waco, TX, before moving to Los Angeles with his father, also in the insurance business. Russell ran the Colorado branches of the Frederick Rindge’s Conservative Life Company, before the 1906 San Francisco earthquake. When the company was absorbed into Pacific Mutual, and moved to Los Angeles, Russell was recalled from Colorado to run the “Home Office.” Mr. Russell continued his success in the insurance industry, just as his wife enjoyed great social success. In 1942, their son, John Henry Russell, established the John Newton Russell Memorial Award, as a tribute to his father and mentor, recognizing the accomplishments and contributions of made by an individual in the insurance industry. This is the highest honor awarded by the National Association of Insurance and Financial Advisors (NAIFA), given each year. NAIFA is one of the nation’s oldest and largest associations representing professionals in the insurance and financial industries.